Duke University’s picturesque campus hosts a myriad of activities you may also wish to enjoy during your visit. 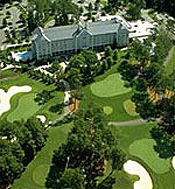 Play a round of golf at the Duke University Golf Club. Please contact the club directly (919) 681-2288 to reserve a tee time. Explore the historic campus and take in the stunning architectural elements including the Duke Chapel. Guided tours of the Chapel are available to groups and may be arranged by emailing chapeltours@duke.edu or by calling (919) 681-9488. Stroll through the Sarah P. Duke Gardens, which offers 55 acres of walking, picnic areas and botanical gardens. Guided tours may also be arranged by calling (919) 668-1705. Visit the Nasher Museum of Art. General admission price is $5. Admission is FREE to all on Thursdays from 5 to 9 p.m. Hike one of the many Duke Forest trails. Pop in to Cameron Indoor stadium, home of Duke Blue Devil’s Basketball, the Hall of Honor and the Hall of Fame which showcases of Duke’s athletic accomplishments through the decades.